Donkey Kong no Ongaku Asobi is a canceled game set for release on the Family Computer. It would have followed Popeye no Eigo Asobi and released alongside Donkey Kong Jr. Math as one of the edutainment games based on the Famicom's launch titles. Donkey Kong no Ongaku Asobi starred the cast of Donkey Kong and Donkey Kong Jr. The game never surfaced, and seems to have only been announced in 1983 in a Japanese handbill as well as magazines. The game featured two modes: Music Quiz and Donkey Band. One Player: Mario plays the notes, with Lady and her hammer on the sidelines. Two Players: Both Mario and Lady play the notes; Mario is Player 1, while Lady is Player 2. 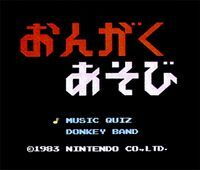 Donkey Band would be played as a karaoke styled game in which included the player singing into the Famicom player 2 controller microphone. Donkey Kong is on bass once more with Donkey Kong Jr. playing drums, Mario playing a grand piano and Lady as a vocalist. Although the game was never released, Lady, or rather, Pauline's role as the vocalist in a band was ultimately reused with her acting as the lead singer in The Super Mario Players band in Super Mario Odyssey. ↑ Donkey Kong’s Fun With Music [NES – Cancelled]. Unseen 64. Accessed June 16, 2008. ↑ Cifaldi, Frank. Nintendo’s (First) Lost Donkey Kong Game. The Video Game History Foundation. Retrieved November 10, 2018. This page was last edited on November 24, 2018, at 20:48.